I don’t know about you, but I have a big problem with the Tea Party in the United States. I know it’s not actually a party any more but its former members have become so outspoken in the Republican Party that is painful to watch and listen to. They claim to love God and Jesus but they don’t seem to act that way. They seem to use the Bible for their own benefit. (getting elected) So I took some of the Bible and wrote what they seem to be really saying. Guns are our refuge and strength, an ever-present help in trouble. So how does the Tea Party look to you? Christian…. Why vote only Republican? Well, that got me thinking, “Why do many Christians believe you have to vote only Republican?” This was the way that I grew up but why? The two main issues that are normally stated are abortion and homosexuality. I understand that their reading of the Old Testament condemns homosexuality and so does the book of Romans. Abortion is never outright condemned, but Christians do believe that life is precious and shouldn’t be ended “prematurely” by man. God gives life and only God should take it. (Which makes me wonder why many of these Christians back the death penalty.) It is curious to look at what Jesus says and that he never mentions either of those subjects even though they were happening in his day. Do you think Jesus thought they weren’t all that important of issues? Furthermore, will Rick Perry , Jeb Bush, Bobby Jidal or Ted Cruz do anything to stop abortion or prevent people from being homosexuals? (like that’s possible)Reagan nor either of the Bush presidencies did much and neither will any of your Republican hopefuls. To me, they simply seem to be using these issues to get elected and therefore using you. What about the other issues? What about the poor? Jesus often talked about taking care of the poor. What about health care? Is that taking care of the poor? Which party really takes care of the poor people in this country? Which party is trying to get health care to the needy? Which party voted for equal pay for women? Which party wants to raise the minimum wage to help the poor? What about creation? ( environment) Who passes better legislation or repeals it? Do Christians know which administrations have done the most good or harm for God’s Earth? Or do they both give in to big business and screw creation? Is not education important to Christians? Is mandating “No child left behind” good or bad? Do you just guess or are you involved in education? What do you know about Common Core and what teachers have to go through? Who cuts help to schools or to libraries? Is that more a Republican or Democratic thing? Do you pay attention? How about the war? I understand defending your country, but isn’t Jesus the “Prince of Peace?” I also understand defending the weak and helping your neighbor, but is that being accomplished? So, which party will do what is right? Who will start helping people by not bombing another? Jesus often spoke about the dangers of wealth and power. Are our candidates above this, or corrupted by this? Does either party do anything without consulting the people who gave them the Money to run? Which candidates are in the hands of the Koch brothers? Which are in the hands of Unions? Have you asked these questions? On this note, what about the deficit? Are we voting for candidates that promote being responsible with our money or those that promote spending more than what we have and running up our governments credit cards and loans? Reagans economic policies of do it now pay for it later taught Americans it’s ok to rack up your credit card bills. It was also responsible for the biggest non war deficit in American history. What about purity and honesty? Does either party promote this? In my lifetime (40 years) there has been political scandals and corruption associated with every administration. (except maybe Ford) Watergate, Iran Contra, Monica Lewinsky, Spygate to name some of the bigger ones. Can a person truly say that one party is more Godly than another? Everyone of our presidents has claimed to be a Christian, whether from the Democratic, Republican, Federalist or Whig party. It is clear that most of them were not. In the past 46 years we have had a Republican president 28 years and a Democrat 18. 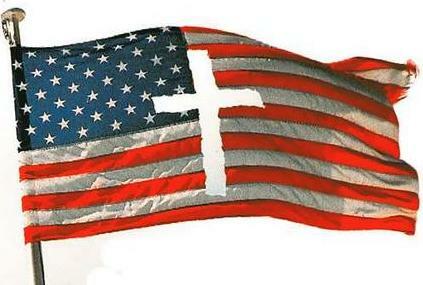 Is our country more “Godly” or “Christian” because of the leadership of Nixon, Ford, Reagan, or either Bush’s? During the Obama, Clinton and Carter years, did we become less Godly? I don’t think so. So I ask, why should a Christian vote only Republican? What do you think?